Good morning. The situation has become more intense. Irma has strengthened to a Category 5 Hurricane with sustained winds of 175mph. We are up early this morning, and headed to get more supplies such as batteries and water. The place we are staying has removed anything from the outside that could be blown away. All of the lounge chairs have been tied together, and put into the pool with rocks holding them in place. It is such an eery sight. 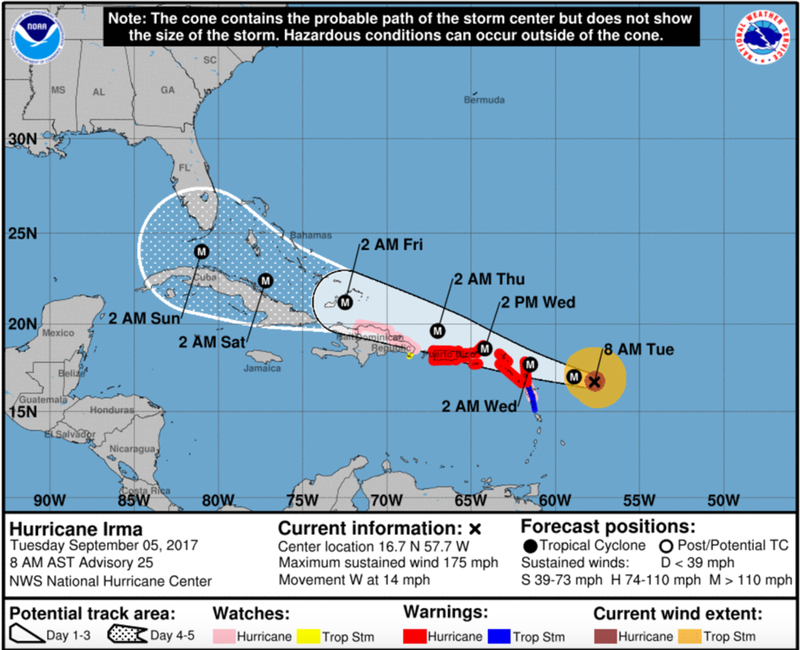 Current track of the storm puts the eye closer to Barbuda, and the storm continues to move Westward (not what we want). It is 280 miles out from Barbuda, and 270 miles out from Antigua. The impacts will begin later today, and the cloud layer from the storm is just starting to funnel in. I also want to lift all of the people on the Islands of Anguilla, Montserrat, Saba, St. Eustatius, St. Kitts, Nevis, Sint Maarten, St. Martin, St. Barthelmy, British Virgin Islands, U.S. Virgin Islands, Cuba, Puerto Rico, Vieques, and Culebra. These islands are also under Hurricane Warning. We also want to pray for those that may be in the path later in the week (from Florida up the east coast). Please spend time in prayer for these places who will be impacted. We cannot fathom the size of this storm and the destruction it can cause. We are on our knees praying constantly as this storm approaches.